Woombie Med Pods were created by a nurse and a Child Life Specialist, two women who knew that caring for a hospitalized infant was not only about their phyical needs, but also their psychosocial needs. Woombie Med Pods are empathy-based products that support an infant holistically and meet the needs of staff, family, and patient. In order to ease the transition from the womb to the world, a newborn should be swaddled tightly, to mimic the womb. This prevents triggering the moro reflex, causing the sensation the infant is falling, and helps baby feel safe, secure, and comforted. The patented peanut shape allows range of motion in houlders and hips, something a blanket does not. This is the safest, healthiest way to swaddle. A fetus moves up against the walls of the womb inutero similar to a butterfly in a chrysalis. Part of this is just baby being active, but it serves a much bigger purpose which is strengthening its muscles. Woombie Med Pods are made with a signature Bebeflex fabric that provides the stretch and flexion needed to work babies muscles, hopefully preventing physical therapy for the hospitalized infant who is not getting held, moved and stretched as much as a newborn at home would. 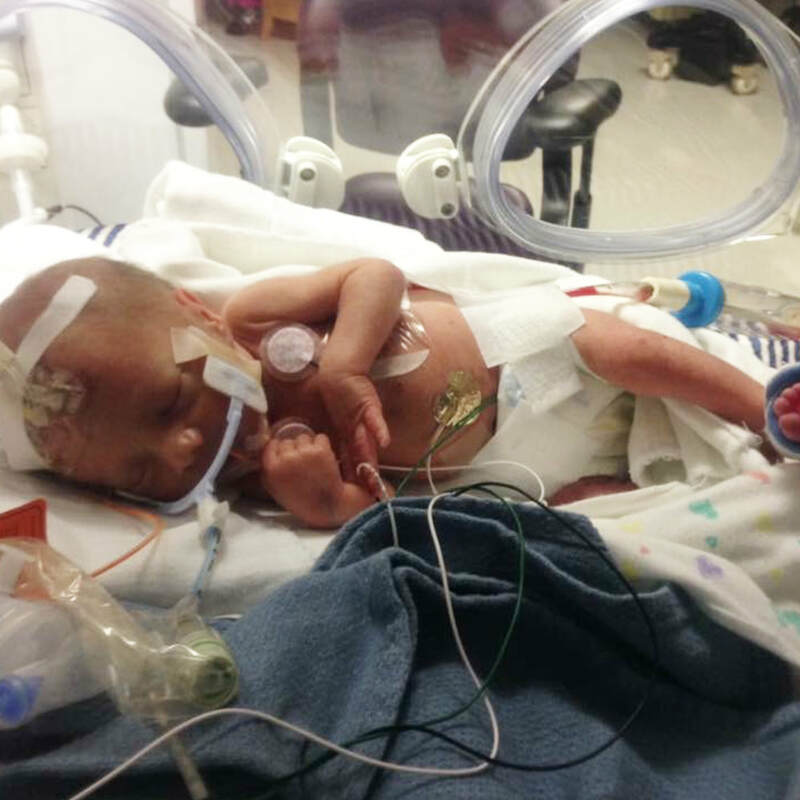 We were not shocked to hear from a clinician at Franciscan Children's Hospital when she shared how amazed she was at the infant who successfully completed an EEG procedure while calmly swaddled in a Woombie Med Pod. Reportedly, the nine month old didn't even cry during a procedure, which typically requires papoosing and ends with both caregiver and baby in tears. Imagine comforting an infant in a Woombie Med Pod during NG tube placement, IV start, heel stick, dressing change or trach suction. They'd feel safe, comforted, and loved, without the neurological stress caused by moro reflex and without having to restrain them. We KNOW swaddling supports psychosocial care of infants, yet hospitalized infants are often unswaddled because staff needs to access them for medical care. A Q4 vitals check means lots of wrapping and unwrapping, but not if youre using Woombie Med Pods. Speak to purchasing department and decision makers on your unit and advocate for change! Make Woombie Med Pods part of your hospitals best practices. When Woombie Med Pods hit the scene, we heard from medical professionals and parents how much they loved Woombie swaddles. They were curious to learn about Med Pods because of the Woombie brand. 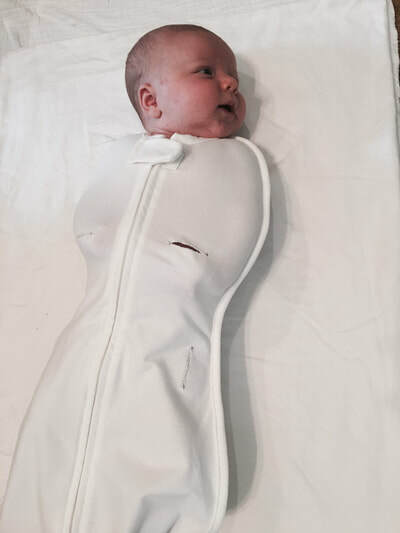 The basis of our medical swaddle is the patented peanut-shaped Woombie, which has sold over a million and proven its success in the infant world for over ten years. Woombie is unlike anything else! The peanut shape allows for movement in the hips and shoulders. A blanket or other swaddle that requires arms down for security restricts movement in these areas and can lead to tight shoulders and hips. The double zipper allows for easy, efficient diaper changes without disturbing baby or unswaddling. The unique four-way stretch fabric allows the infant to move within the swaddle while still providing boundaries and containment, something an infant needs in order to feel safe and secure. Woombie Med Pods was born to create a way for preemies and hospitalized infants to benefit from this unique swaddle the way infants at home have been for over a decade. Blankets and other swaddles just don't do what a Woombie does! Woombie Med Pods allow hospitalized infants and preemies to be swaddled the same as an infant at home because they work WITH treatment and work AROUND medical devices. 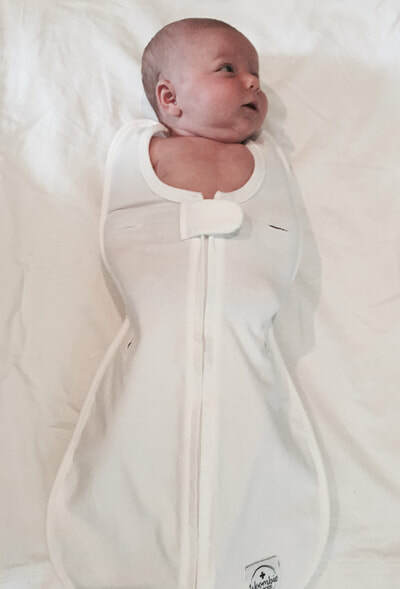 "We can't swaddle her because of the colostomy bag"....the Woombie Gastro Pod features a midsection flap that allows access to the bag or g-button. "We can't swaddle because this preemie has so many monitors and central lines"...The Woombie Med Pod has custom slits at top and sides for lines and leads. "We can't swaddle him because he needs phototherapy for bili levels"...the Woombie Bili Pod allow full luminosity during treatment. "We never swaddle our trach babies"...the Woombie Trach Pod features a deep v-neck so this population can be swaddled without restricting access to trach for suction or ventilation. We've thought of it all! We've covered our bases! Woombie Med Pods were created by Karen Barski (a nurse) and Chelsea Vail (a Child Life Specialist), both mothers and newborn care educators who know infants MUST be swaddled during the first three months of life for healthy development and psychosocial care. VisitWoombieMedPods.com to learn more and email info@barskivaildesigns.com if you'd like these in your hospital! ​Mayday, mayday! Swaddling is in danger! Rumor has it that many hospitals in the US are moving away from swaddling their neonates and infants. This is a travesty. If tight quarters weren't necessary for neonates, why is the womb like a studio apartment? Why not let baby hang out all loosey goosey and float aimlessly inutero? Babies like containment! They need boundaries otherwise they feel lost in space and as if they're falling, igniting the fight or flight response in their nervous system. Anthropologists believe that human once has a twelve month gestational period. This is why the first three months of a newborn's life is called the "fourth trimester" and babies have traditionally remained swaddled or worn snuggly during this crucial period of growth and attachment. 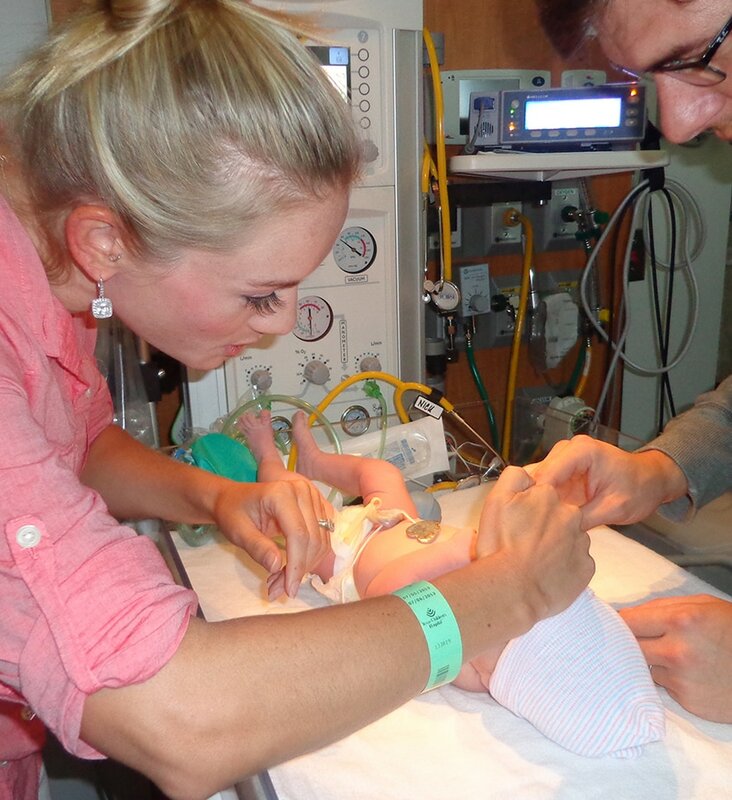 The dangers of hospitals moving away from swaddling are far greater than one may realize. We'll likely see increased length of stays in hospitals, increased need for medications, physical therapy, decreased success breastfeeding, increased post partum depression rates in mothers, and the long term effects may include a plethora of emotional and neurological deficits. Woombie Med Pods were created out of a passion for swaddling and the developmental benefits of the practice for neonates and infans. Help us by spreading the word about swaddling and encourage your hospitals to bring Woombie Med Pods onto the units where babies are cared for! The US is Ten Years Behind! Read this in your best British accent because I feel it adds emphasis deserved, "The US is actually ten years behind in empathy based practices". Let this sink in. America is ten YEARS behind Europe when referring to empathy in hospitals. This means hospitals all over the globe are caring for patients in a kinder, gentler, more humanistic way that we're unlikely to put into practice for ten years? This doesn't sit well with me. I believe our patients and families deserve more. The above words came from a highly intelligent member of the medical community visiting from the UK who discovered the fabulous Woombie Med Pods at the American Academy of Pediatrics Conference in Chicago this year. He said, "These belong in Europe!" And, we currently have interest in Woombie Med Pods from countries all over the globe! But, being an American based company, we want you to see what we see (and what they see). Woombie Med Pods are not your average "swaddle sacks". In fact, we toyed with refusing to call them that at all. These are Developmental Care Products meant to support patients and families psychosocially.